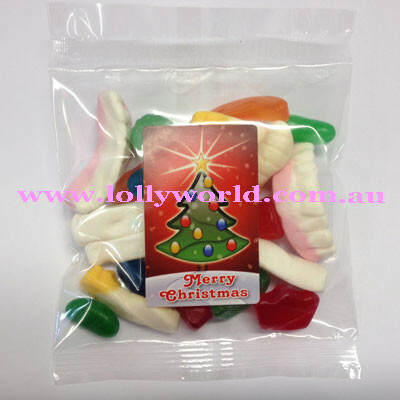 Party Mix Xmas Tree Lolly Bags are perfect for Christmas parties, promotional giveaways or a small gift for a friend. A mix of our Fresha Party Mix, this 100g bag comes with a sticker, a cute picture of a Christmas tree. The mix contains a random lolly assortment of Milk Bottles, Witchitie Grubs, Snakes, Strawberries & Creams, Laughs, Raspberries, Jelly Beans, Jubes, Wine Gums and Mixed Berries. This way everyone gets their favourite lollies in one bag!